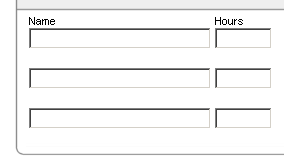 There was a question on the OTN forum about alignment of page items which should look like a tabular form. I thought it might be of general interest, so I created a short posting about it. As you can see from the posting, the person asking tried several different settings, but got gaps between the fields or they where not aligned as desired. This will not generate any label information. No gap is generated as it is done when you select “No Label”. The following image shows how it looks like with Label Template set to “No Label”. This entry was posted in Tips & Tricks and tagged layout by Patrick Wolf. Bookmark the permalink. You blog is a must have in apex developer favorites.